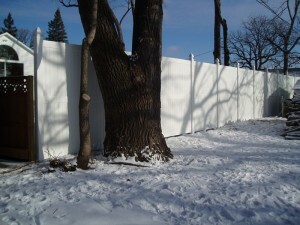 Searching for a Minnesota Vinyl Fence Contractor? 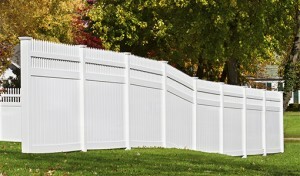 Contacting Arrow Fence Co in Minneapolis, MN is a great start! We offer Maintenance-Free Vinyl Fencing that is tough as nails but won’t rust! Our Vinyl Fence Estimate is always FREE & every Vinyl Fence Installation project completed is backed by our 5-Year Warranty! We have been in the fence installation business, as a company, for over 50 years! There are no wrong turns when choosing Arrow Fence for your Minnesota Fencing Installation. Read our Facebook Reviews! Check Out our Google Reviews Too! Vinyl has gotten a bad rap, here, in Minnesota. With the temps at or below freezing for around six months of the year, a vinyl fence has much to face each day. It is common to hear of cheap vinyl fencing warping or getting sun spots. To clear this up, that is not our product. The vinyl fencing products we use are high-end. Call it ‘Minnesota Tough Vinyl Fence’. We’ve chosen the ‘Vikings‘ of vinyl fencing and offer it to homeowners that will appreciate all of it’s benefits. Not all vinyl can stand up in our winters. With our 50+ years of experience, we only supply those vinyl brands that can. Highly Customizable – Maybe you are interested in a Vinyl Picket Fence? Or maybe a Vinyl Privacy Fence? Or just a Vinyl Focal Point… The good news is our vinyl fencing is highly customizable; all the way from color to design. Our skilled team can easily create a vinyl fence like you have never seen before, if that is your wish. Virtually Maintenance Free – Unlike wood fencing, vinyl fencing does not need any maintenance. No staining or painting, now sanding or smoothing. Just a quick rinse from your hose now and again to keep it clean and that is all she wrote. Fill out our Online Contact Form or call Arrow Fence Co. during business hours to schedule a free on-property fence estimate at (763)755-0088.